The majority of the stream involved Kameda talking with Muroi. Kurita sometimes chimed in while Oonuma, Nakagawa and Okazaki barely said anything. I missed the start of the talk, but tuned in when they were discussing their first exposure to Kanada’s animation or the Kanada style. Okazaki, Kurita, Nakagawa and Oonuma mentioned either Genma Taisen (and the Kanada Dragon) or watching something done by Imaishi. Can’t recall what Muroi said, but he mentioned seeing slightly different animation on Ghibli works and realised the bits he noticed were always done by Kanada. Kameda also first came into contact with the Kanada style via Imaishi. He remembers reading an Imaishi interview and the name Kanada or Kanada style always came up, which promoted Kameda to look further into Kanada. Kameda saw the Bryger intro and was simply amazed by it all. Because this was an informal chat with drinks they often veered off topic. Kameda recalls how when he first entered the industry people thought he had something to do with Kanada because of their names. He explains how ‘Yoshimichi’ could often be misread as ‘Yoshinori’ and when written in Katakana, ‘Kameda’ and ‘Kanada’ are but a tiny stroke apart in difference. He also mentioned how the Sakuga@Wiki wrote his name as Yoshinori Kameda at first which he then had to clear up. In terms of meeting Kanada, I believe Muroi was the only one who met him face to face. He showed a signed autograph from one of Kanada’s doujins. Kameda said he had heard Kanada was working on some imageboards for the FMA:Brotherhood video game but was unable to meet him. Though the topic somehow veered towards how everyone met Kameda, to which he had to tell everyone off as the talk was about Kanada not himself! Muroi asked what the difference between those that simply copied Kanada’s style and the man himself. This was a bit of a tough question and eventually Kameda says what made Kanada’s animation unique sadly died along with him. However with regards to himself he was worried he’d up being a Kanada or Imaishi copy-cat but persevered into making an original style for himself. They discuss Dokonjo Gaeru/Gutsy Frog for a moment, and how it had some really good Kanada animation back from his ‘A-Pro’ days. I couldn’t quite get what they said but there was a comparison with Disney animation brought up. IIRC it was something like, Dokonjo had charm and quality but different to the kind Disney managed. Kameda says you can tell Imaishi’s love for it when he snuck some Dokonjo Gaeru characters into the backgrounds of a Mahoromatic episode. 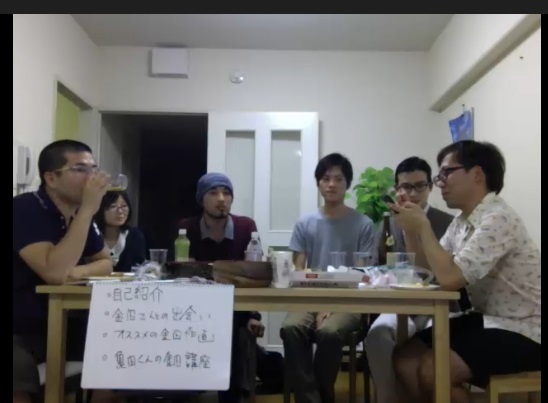 One of the viewers on the stream commented and said ‘Hironori Tanaka is the modern day Kanada’. Kameda went on to agree though saying that even though their animation styles are different, Tanaka has created this unique artstyle and how he has spawned a new legion of animators who look up to him, it is very similar to what Kanada managed back in the late 70s. While working on FMA:Brotherhood Kameda remembers looking over Tanaka’s animation and flipping back and forth because of how good it was. Speaking of FMA:B, someone noted FMA:Brothered was Kameda’s greatest work up to now and he replied back saying Kurita’s was definitely Bleach. Kameda goes onto mention Sakuga MADs and how they are very exciting to watch but at the same time he gets nervous as it shows there are so many great animators about. He later mentions there are many great young animators these days, two he mentions are Takahiro Shikama and Hiroyuki Yamashita. Kameda moves on to the next topic and says that Kanada was constantly changing as an animator. Even though in the early 80s there were many animators who were driving and pushing the Kanada style, one especially called Masahito Yamashita. Kameda says that Kanada went on to look at what these other animators were doing and absorbed what they were doing back into his own animation. Bryger’s OP is a point where you can see such a change in his animation. Kameda then talks about how he loved the lightning effects on the FMA:B movie by Kenichi Kutsuna. Someone (Muroi? or maybe it was Kurita..) says how some of his favourite Kanada work is on the Vampire Hunter movie. The effect and action work on that film is really excellent. Kameda said the Kanada dragon from the ‘X’ movie is one of his favourite Kanada things. Kameda mentions that while he worked as an in-betweener at Gainax during the production of Gurren Lagann, he was extremely nervous about approaching Imaishi and the other professional animators, those that he worshipped were right before him. The most he could muster up was asking Imaishi for an autograph. Kameda also notes that the young Yoh Yoshinari also had a strong Kanada dynamism to his animation. Especially on the Evangelion TV show. Muroi speaks about Ghibli movies and he praises how they have a lot of movement, but it’s not wasted movement and how it often has basis in reality. Kameda said he would go searching out obscure movies, going from rental stores to rental stores just to see their animation. They quickly mention the ‘Download‘ and Birth OVAs though I forgot what they said about them. Kameda managed to see ‘Download’ Key Animation before he watched the OVA and was highly anticipating the Kanada scenes. They mention the 009 OP, Acrobunch, Gaiking, Gundam and Yamato in passing but I can’t remember anything of significance. Overall it was interesting to watch, you could tell Kameda and Muroi were getting more and more excited with each new drink. It’s a shame the other 4 people barely spoke, I would have loved to hear more of their viewpoints. Kameda came across as the most informed of the bunch, his love for animation and the history behind it really shone through. To think he watches Sakuga MADs and reads the Sakuga@Wiki was a delightful touch, at several points he even pulled his phone out to look things up on the Sakuga@Wiki haha. I know for a fact there is a whole bunch I missed out on (or got wrong), but hopefully there is enough here for you to have enjoyed reading this. This entry was posted in Animators and tagged Animators, Yoshimichi Kameda, Yoshinori Kanada. Bookmark the permalink. Ah that was really interesting. I always thought Kameda’s animation had a hint of Kanada’s style to it. lol I hope this type of thing happens more often.